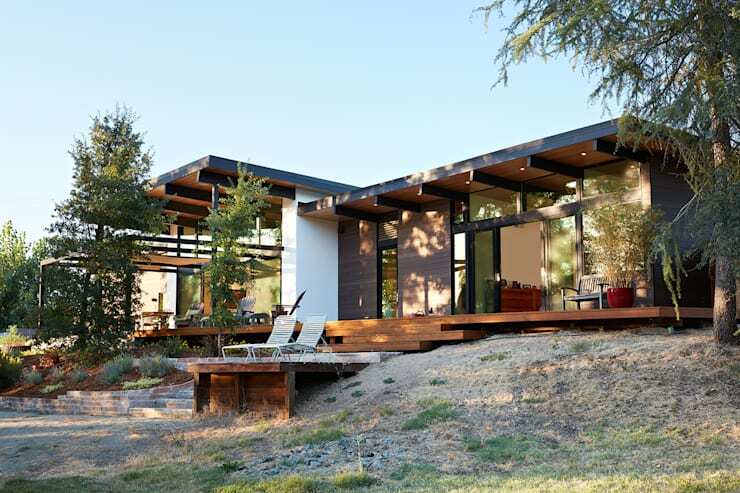 This modern residence in Sacramento, California is brought to you by the architects and designers of Klopf Architecture (built by Van Gelder Construction). 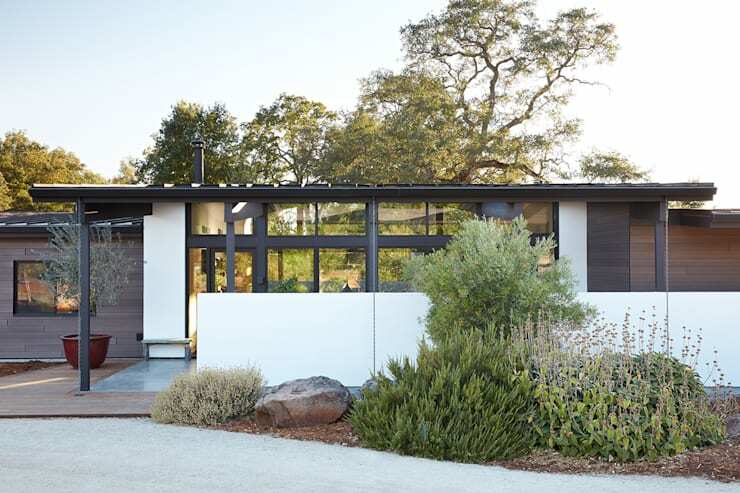 The existing home you’ll tour in this ideabook is a replacement for the ranch home that once sat on the site, aligning with the owners’ preferred aesthetic: clean lines, simple details, and openness to the outdoors. 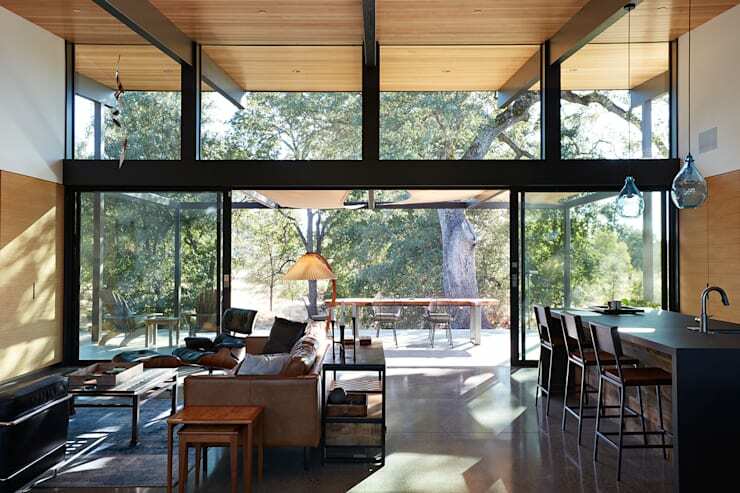 The house is 2,633 square feet, with 3 bedrooms, 2.5 bathrooms, and many, many windows that allow for an intimate connection with the outdoors. Located on a large plot surrounded by an open field, the home’s semi-rural environment includes a number of mature oak trees, as well as a seasonal creek. Throughout the tour, you’ll see how this calm environment enjoys a close connection with the house, both inside and out. 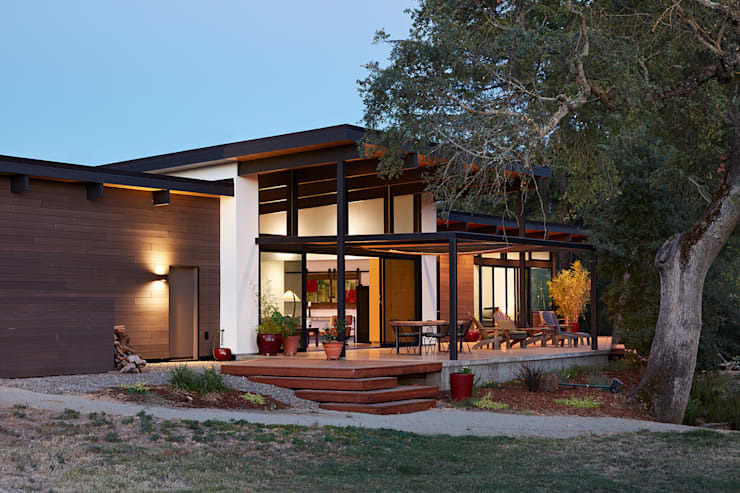 The exterior of the home maintains a relatively low profile that doesn’t attempt to out-do or overwhelm the natural environment, instead opting for a subtle, sleek, and somewhat serious appearance. The back of the home opens up generously, featuring a large portion of the floor plan dedicated to the wooden patio. The home glows brightly at dusk, the glazing allowing the outer areas of the home to be easily illuminated from the inside. 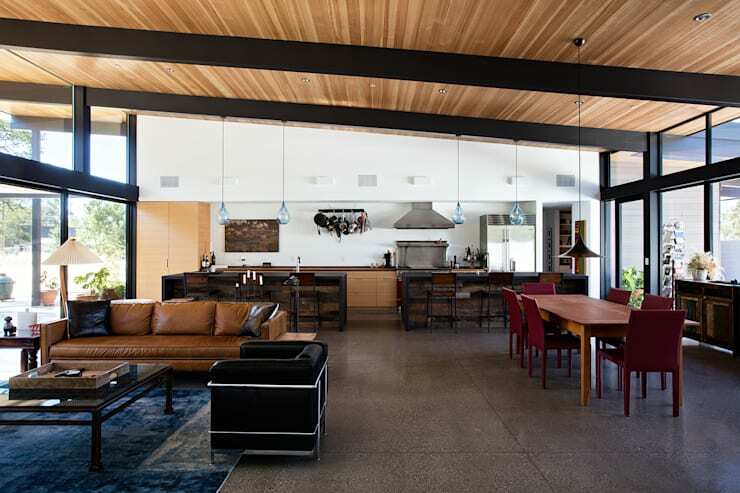 The common areas of the home have been combined into a single, large, open concept area in the center of the building. 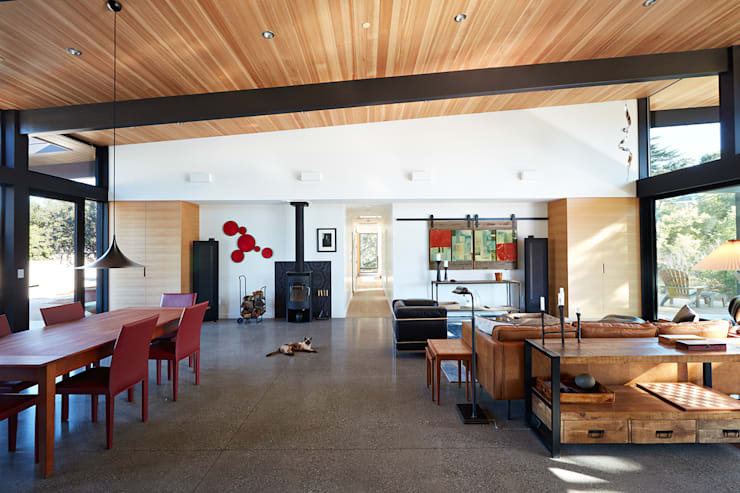 A slanting shed roof establishes a room with an asymmetrical shape, with thick black beams drawing strong directional lines as they reach towards the windows on opposite walls. Kitchen, dining room, and living room are all included in this space, with ample access to an adjacent patio that lines one side of the home. A variety of wooden materials establishes an organic and natural atmosphere, with a range of black, white, and grey to fill out the colour spectrum. A deep red has been incorporated in bits and pieces, bringing along with it a sense of audacity, assertiveness, and energy. A view towards the backyard shows how the common area of the home enjoys a very open relationship with the nearby patio. Filtered sunlight streams into the room, drawing interesting shapes across the interior walls, adorned with nothing more than shadow and light. 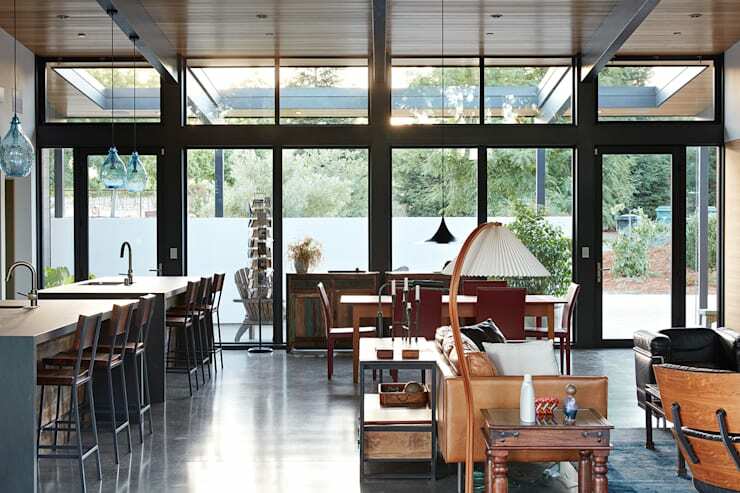 A view towards the facade and street-facing side of the home shows an extension of the home’s eaves, where an array of sky windows create a simple and sunny front porch. 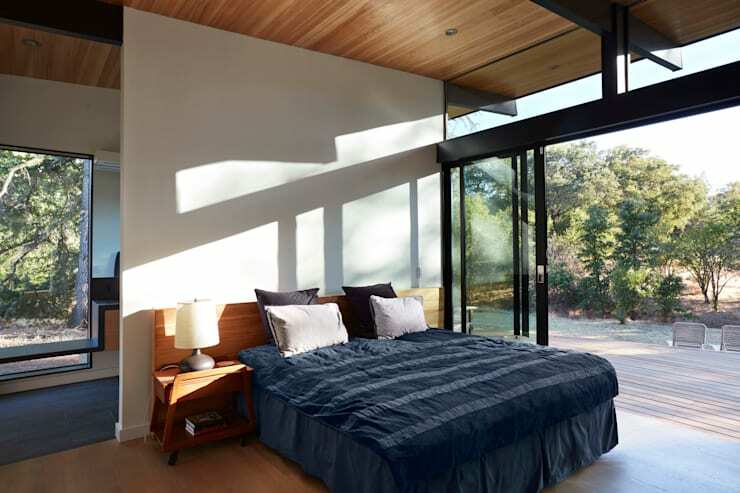 An example of how the architects have designed this home to live in close contact with nature, this bedroom not only features large transparent sections in its walls, but they can also slide aside to join the indoors and outdoors as one. 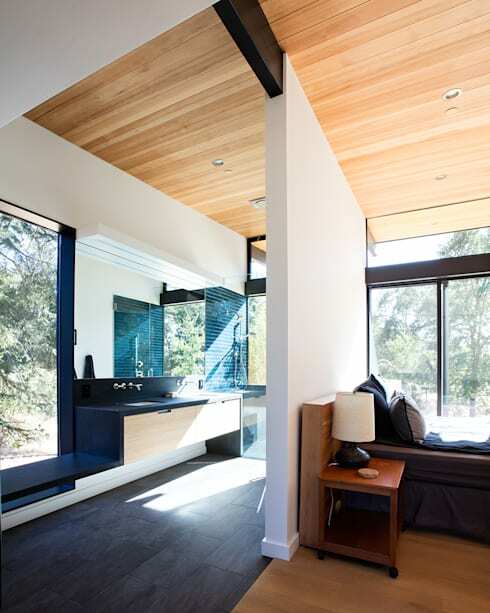 This en suite bathroom is separated from the bed by nothing more than a partition wall, also enjoying a surprisingly open connection with the outdoors, made possible by the absence of neighbors and presence of plenty of foliage! Head Eastward to Colorado to tour another nature-inspired contemporary home (complete with private yurt!) in this ideabook. Share your comments on this contemporary house design below!